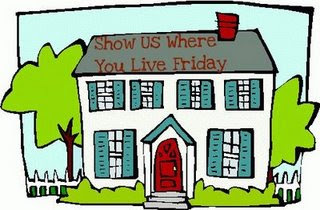 Welcome to "Show Us Your House Friday"! This week is guest rooms! Here are a couple of before pictures, sorry I don't have a few better before & afters. And the after pictures. We painted the room a golden yellow with a white glaze. And of course new carpet! These are my hutches which I display all my precious moments and Dreamsicles. All the furniture in this room was mine from when I was little. It was my mom's when she was young as well! Well, that's about it! Not much to it, but I do still love it! Can't wait to see other's guest bedrooms! I love the room but the quilt and pictures are my favorite. Love the color and the quilt, thanks for the tour! Those are such cute pictures! I love ladybugs! Thanks for sharing your adorable room. So bright and cheerful! I love the lamp too. I love your windows and your colors! What a fun room! What a bright fun room! :-) love it! What a cute room....I love the pictures! Very Happy Room! I love the pictures!